There's a lot of fun to be had at little fuss or expense. You can buy these EDF units, assembled ready, for £15 to £20. This one at 70mm claims to produce 1350gms of thrust at 450watts. I've used the smallest one, 220watts in a Messerschmitt 163 Komet effort. 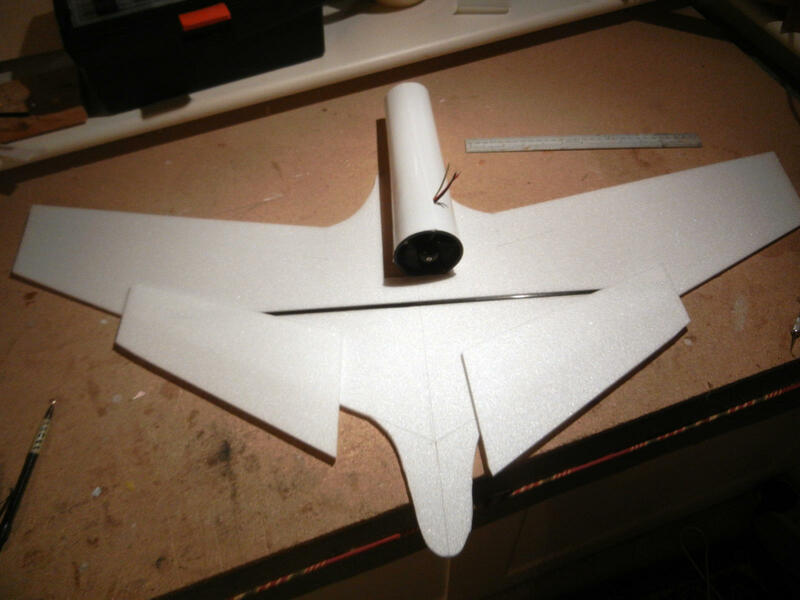 DH 115 Vampire Foam EDF Moved to Scratch build Foam forum! De Havilland planes - don't you just love them! Using with one of these little integrated EDF units, I plan to build a scale-ish model using 6mm depron foam. The fan is 64mm, 220watts. If I start with the 3-view, below, and put one of those fans in it, I get a wingspan of 900mm. Using KFm4 airfoil and taking a little bit of licence for the sake of structure and convenience, I reckon I can make a versatile, small, fast plane, hopefully weighing about 1lb. Did you know...? The first prototype flew in 1943. One of these was the first jet to fly across the Atlantic and the first jet to land and take-off from a carrier and the first RAF plane to exceed 500mph. Over 3,000 were built and exported all over the world. Interested in building your own electric r.c. model planes? I started from scratch in 2002, knowing nothing and already aged over 50. Like most others, I began with a Ready-to-fly trainer. Something like this is easy to fly, not too easy to break. At 55" wingspan it's big enough and slow enough to give you a little time and it won't break the bank. Don't try your first flight on a windy day! After fetching it from people's gardens, climbing up trees and trudging over fields, I finally managed to stay airborn till the battery ran down. Wahoo! Pretty soon more excitement was needed. Sticking with the not-too-easy-to-break theme, I went for a Zagi flying wing. That also took a little time and a lot of exercise before it was tamed. Then came the need for some of my own creative input. This time, laser cut balsa kits were purchased, eg from Stevens Aero or Mountain Models. A great deal of building, retrieving and repairing has ensued. As the flying skills improve, exercise for me reduces while exercise for Paddy increases. I hope you enjoy my model flying story. A Mountain Models Tantrum and the photo is dated September 2004. Everyone needs a flying buddy. That's my dog, Paddy. Stevens Aero Stella, March 2005. My favorite! Well here I am at last. I've cleared the decks, spread out the plans and made a start. A blank canvas! whoopee! In my mind's eye it'll be perfect. Straight and square, easy to fly, authentically finished. That'll be a first then. I'm not sure the world needs another black Mosquito. If you want to see a really good one, have a look at the build thread by Pentaxman, last year. This is my second Ivan Pettigrew build. If it gives me as much fun as my Minicat I'll be delighted. A fascinating, hi-tech mission. Have a look at harringtonmuseum.org.uk. These guys were based just up the road from here. I was talking to a neighbour of mine, an old man who remembers smoking Lucky Strikes when he was a boy. That made him a life-long Yank-o-phile.